Last week, four companies expressed interest in building an express train to O’Hare in response to a request for qualifications from the city. Mayor Rahm Emanuel, the project’s most visible advocate, has argued the train would make Chicago more attractive to business and bolster our international image. But as researchers who study urban planning, transit investments and funding, we believe that an express train between O’Hare and downtown Chicago is a flashy solution in search of a problem. In other words: It’s unnecessary. Worse, it could siphon political will and public resources away from needed projects, while triggering construction and capacity problems. Here’s why public transportation agencies and the general public should derail this process before momentum takes over: Chicago already has a direct transit connection between O’Hare and downtown: the Blue Line. In fact, among the nation’s 40 busiest airports, a FiveThirtyEight analysis identified O’Hare as a unique example where the train is already a good option for downtown and can often beat a taxi in travel time. Improvements along the Blue Line have sped up the trip, and the recently announced FastTracks program will allow increased frequency. Chicago is already winning the competition for good train access to a major airport. Beyond being unnecessary, we see risk for harm due to a possible diversion of scarce public resources. While the RFQ clearly states there will be no public funds provided, transportation projections of ridership levels and recouping production costs are notoriously overly optimistic. It’s likely that a funding gap will emerge as cost projections escalate or a construction problem emerges. We expect that the public sector would then fill the funding gap. This happened in Detroit, where business and civic elites first began planning a privately funded streetcar. Realizing they needed more money, they then turned to the public sector and even had to seek a second round of federal dollars to cover a funding shortfall. The project, which especially benefits those who own land along the streetcar—many of whom pushed for the public spending—will require public operating subsidies when the private operator turns over the infrastructure in 10 years. Even before detailed planning has started, we see hints of public spending for the express train. Press coverage has already mentioned that the public sector might pay for a station or a station upgrade. Even if the public sector does not fund a cost escalation or a station, the private operator will turn to the public sector for subsidies if ridership and hence revenues fail to match overly optimistic forecasts. An infrastructure project also comes with trade-offs. Construction causes hassles and pollution in impacted communities—something we have been living with in many parts of our city the past few years. Furthermore—and perhaps more important—is the question of right-of-way competition between the proposed rail project and existing services that are vital to our metro. 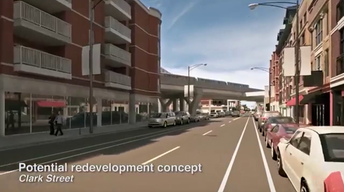 The Infrastructure Trust proposed two routes with rights-of-way along existing transit service (the Blue Line and Metra), which could negatively impact the capacity of these services. If our leaders are going to push for infrastructure investment, let’s see more work to improve our core system (a good example is the FastTracks program, which funds public transit improvements using ride hailing service fees). Social exclusion and limited transit access impact thousands of residents today. As the Metropolitan Planning Council has found, we all lose out because of segregation. The energy and political will expended on a flashy train to O’Hare could instead be channeled to accelerate efforts at the local, state and federal level to secure funds for the much-needed and high-priority Red Line extension or improvements to bus service. These investments will do more to advance an inclusive and prosperous Chicago and will address transit equity for people who live in our city, instead of a train that rushes the already privileged out of it. Kate Lowe is a faculty member at the University of Illinois at Chicago who focuses on transportation and planning. Janet Smith is a UIC faculty member and co-director of the Nathalie P. Voorhees Center for Neighborhood & Community Improvement.